Here is Great news for Nokia fans, Nokia has officially Launched Nokia N8 now! The N8 looks really interesting and is the first 12 MP Camera Phone Camera phone from Nokia and the World’s first Symbian^3 Device . Its Tagline is Nokia N8. Connect. Create. Entertain. The Nokia N8, Nokia’s latest smartphone, intuitively connects to the people, places and services that matter most. With the Nokia N8, people can create compelling content, connect to their favorite social networks and enjoy on-demand Web TV programs and Ovi Store apps. Dolby Digital Plus surround sound by plugging into their home theatre systemhome theatre system. The Nokia N8 enables access to Web TV services that deliver programs, news and entertainment from channels like CNN, E! Entertainment, Paramount and National Geographic. Additional local Web TV content is also available from the Ovi Store. 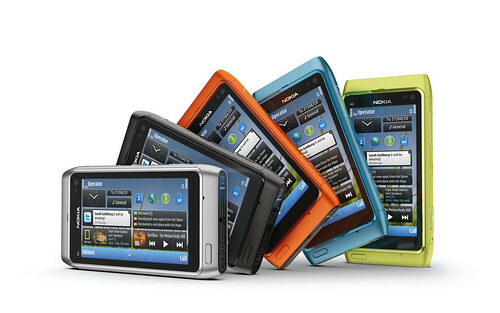 Social networking is second nature to the Nokia N8. People can update their status, share location and photos, and view live feeds from Facebook and Twitter in a single app directly on the home screenhome screen. Calendar events from social networks can also be transferred to the device calendar. The Nokia N8 comes with free global Ovi Maps walk and drive navigation, guiding people to places and points of interestpoints of interest in more than 70 countries worldwide. With These All features, its a phone that Should be added in any Nokia fan’s ‘Must Have List’.